Photos Capture The Joy On Playgrounds Around The World : Goats and Soda From the U.K. to Kenya to the West Bank, photographer James Mollison exposes not only inequalities among rich and poor countries, but also the intimate moments that unfold during recess. At the Aida Boys School, in the West Bank town of Bethlehem, the walls are extra thick to protect students against bullets. Whether they're in a posh London school or in the slums of Kenya, in the midst of war or in a battle against bullies, kids take playtime very seriously. 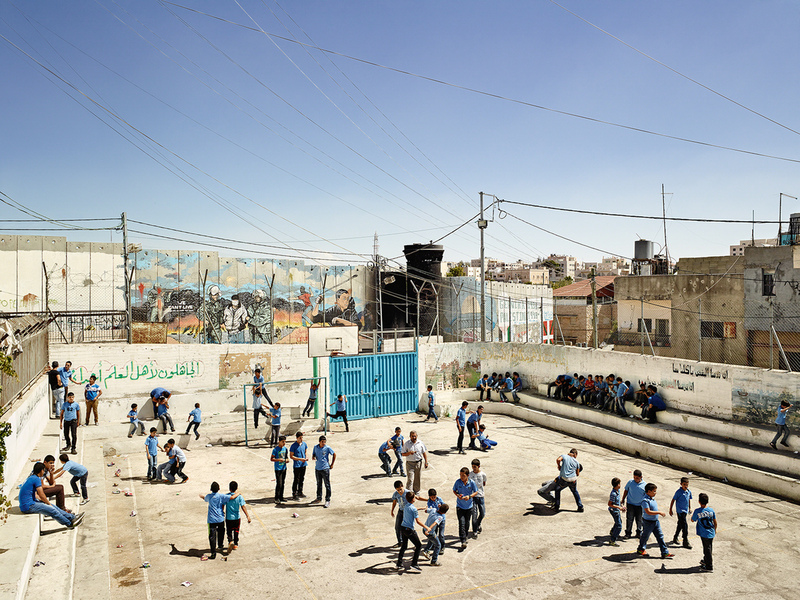 That's what photographer James Mollison learned after spending five years photographing school playgrounds around the world. The project began in 2009, and took him to more than 50 schools in 17 countries. Each photo tells a different story. 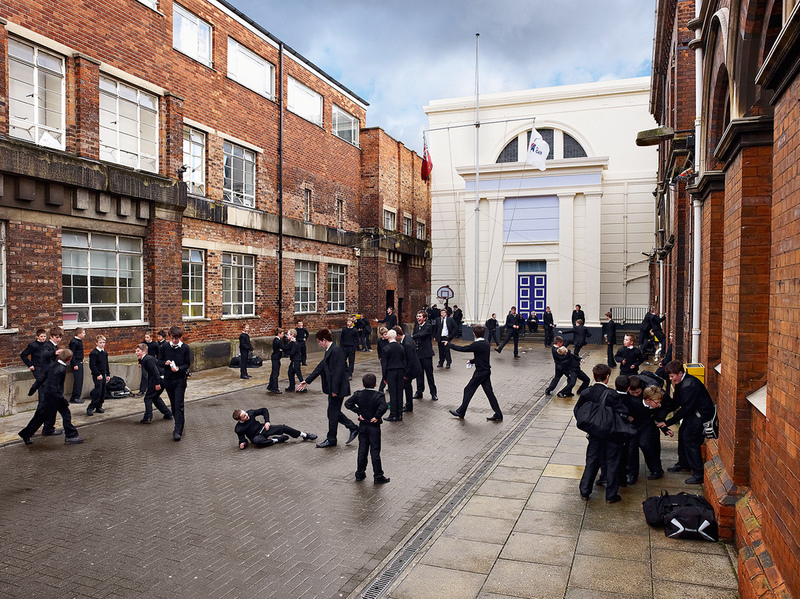 In an image taken at Hull Trinity House Academy, a school for boys in the U.K., boisterous teenagers cluster in groups while, in another corner, a small boy endures a wedgie. 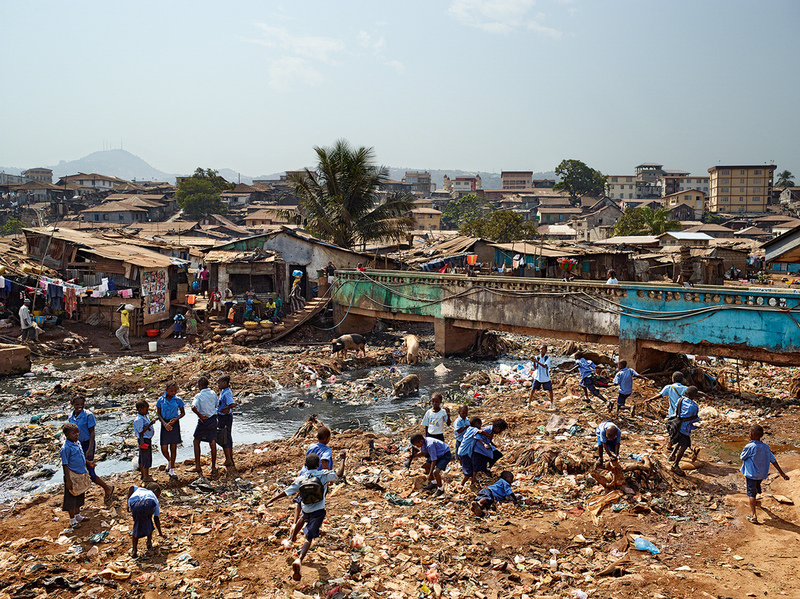 In Freetown, Sierra Leone, Mollison took a photograph of kids chasing each other through an urban valley littered with trash. He remembers worrying that a child might fall and get cut by broken glass. When Mollison reached an Israeli town near the Gaza border, he found students casually walking past a colorful bomb shelter – a common sight. "There were bomb shelters built in the playgrounds," he says, "so kids could run into one within 90 seconds of the alarm going off." Teens take a break on a courtyard between classes at Hull Trinity House Academy, an all-boys school in the U.K. The photos are featured in Mollison's newest book, Playground, which was published in April by Aperture Foundation. They expose some of the inequalities between schools in higher- and lower-income countries. Maybe even more importantly, they give readers a glimpse into the relationships and stories that unfold at recess — all over the world. Mollison says he was inspired by his own childhood memories. He was born in Kenya and grew up in Oxford, England. "I was thinking back to my childhood, and I realized that all of my memories were from the playground," he says. "It had been this place of fun and games, but also [a place] with scary moments." The playground, as he explains it, is where children get their first taste of the real world with little adult intervention. It's where kids form friendships, mold an identity and confront bullies. The most noticeable difference among the schools he visited, Mollison says, was the level of resources devoted to each one. Some offered kids plenty of toys and lush green fields to play in, while others barely had the space to fit all the children. A contaminated river runs through the valley in Freetown, Sierra Leone, where there is neither sanitation nor garbage collection. 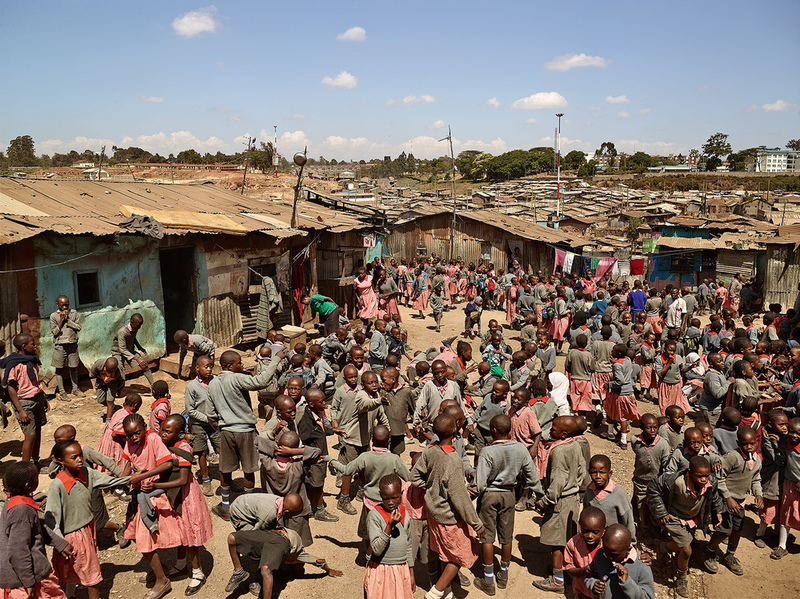 Children from the nearby Kroo Bay primary school play amid the trash. "In quite a lot of the schools in Kenya," he recalls, "they would literally bring out the one ball the school had." But that didn't stop children from playing. In fact, Mollison says there seems to be little difference in how kids play across the globe. In the playgrounds he visited, boys horsed around and wrestled with each other. Girls played jump-rope and hand-clapping games. Some got creative. In Kenya, Mollison witnessed a game called "urr-up." It involved roughly 40 girls linked arm to arm. "Whosever turn it was would jump and dive onto this bed of arms," he says. "Then the girls would use their forearms to throw her up, and propel her forward, and she would be catapulted ... into this crumpled pile [of laughing children]." To capture the perfect narrative, Mollison would sometimes set up his camera in one spot and take multiple shots over a single recess period. Then he would go back through each frame, and piece together several scenes of "little moments" to create the final image. Other photos remained unaltered. It wasn't always easy getting into the schools, he says, particularly in the U.S. and Japan. "To ask to photograph children, you're seen as weird," he says, laughing. His wife Amber drafted more than 50 letters asking for permission. Most schools said no. In the slums of Mathare, in Nairobi, Kenya, the Valley View School barely has enough room for students to play during recess. Classes take place in crowded concrete structures that measure 13 feet by 20 feet. Other schools were more welcoming. "A lot of the schools were very hard up in terms of resources," he says. "So I could give a hundred dollars to help them buy textbooks and that would make a big difference." Clicking away with his camera, Mollison stood out on every playground. Most children ignored him after a few minutes, but he recalls one experience where he became the center of attention at a school in London. "I was assigned a security guard," Mollison says, "and I thought it was because they thought I was dangerous. Then I learned that it was actually for my protection. I had kids aiming balls [at me]. They'd whack it really hard in my direction." He remembers the sound of cheering as a soccer ball just missed him — and hit the security guard, instead. 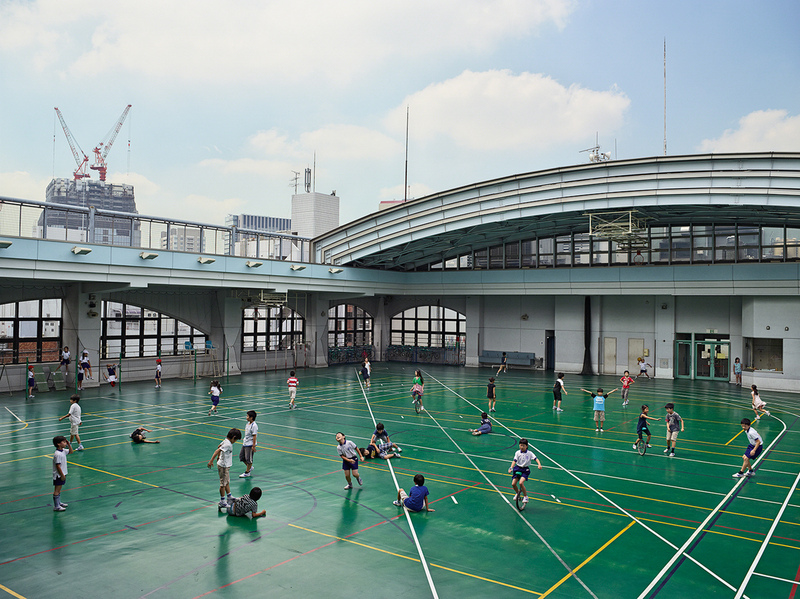 The playground at Shohei Elementary School, in Tokyo, is on the roof of a six-floor building. Students are only allowed to play with balls that are soft, to avoid injuring people on the streets below.